We’d love your help. Let us know what’s wrong with this preview of Lucifer's Harvest by Melvin R. Starr. Finding himself in the same war party, Hugh resolves to watch his back in the presence of the knight, Lord Gilbert Talbot must provide soldiers for Prince Edward's battle in France. He wishes his surgeon--Hugh de Singleton--to travel with the war party to tend any injuries. Among those on the road is Sir Simon Trillowe, Hugh's old nemesis, who had once torched Hugh's house. To ask other readers questions about Lucifer's Harvest, please sign up. My first foray into the Hugh de Singleton, surgeon, medieval mystery series and a very enjoyable outing. This novella was a simple story that kept me guessing, with a bit of a moral twist, as Hugh tries to live the injunctions of the Bible. Hugh accompanies his lord, Gilbert Talbot, to France, along with Prince Edward, the "Black Prince", and we see the English army at the siege of Limoges. The dead body of Sir Simon Trillowe, no friend to Hugh, is found stuffed down a well, and suspicion falls My first foray into the Hugh de Singleton, surgeon, medieval mystery series and a very enjoyable outing. This novella was a simple story that kept me guessing, with a bit of a moral twist, as Hugh tries to live the injunctions of the Bible. Hugh accompanies his lord, Gilbert Talbot, to France, along with Prince Edward, the "Black Prince", and we see the English army at the siege of Limoges. The dead body of Sir Simon Trillowe, no friend to Hugh, is found stuffed down a well, and suspicion falls on Hugh as murderer, so Hugh is out to prove his innocence and to find the real culprit through his sleuthing and forensic talent. I enjoyed the details of medieval life and surgery of that period. This would have been a 5 star book as the rest of his series has been except that it's being advertised and priced as novel #9 when it is in fact (At 133 pages) the size of a novella. However despite it being half the size of the rest of Mel's books our friend Hugh de Singleton does manage to do quite a bit in those 133 pages. The story itself is just as riveting and entertaining as the rest of the series though most of this one takes place in a different setting. The ending was a bit sobering b This would have been a 5 star book as the rest of his series has been except that it's being advertised and priced as novel #9 when it is in fact (At 133 pages) the size of a novella. However despite it being half the size of the rest of Mel's books our friend Hugh de Singleton does manage to do quite a bit in those 133 pages. The story itself is just as riveting and entertaining as the rest of the series though most of this one takes place in a different setting. The ending was a bit sobering but not unexpected for that time period. Not a bad entry in this historical series featuring surgeon and bailiff Hugh de Singleton; just getting a little repetitive. I wonder how many times I've read the words, "He broke his fast with half a loaf of wheaten bread and watered ale." (Or something very similar). Hugh is off to France in this episode with Lord Gilbert at the behest of Prince Edward. While there, he ends up investigating the murder of an old rival, Sir Simon Trillowe. When Mel Starr writes a new book I cannot wait to read it! His books are unique to historical novels with settings in the 1400’s. An era you rarely see written about in fiction especially Christian fiction. I never cease to learn something new. His research has yielded such detail about every aspect of that time that people come to life. I especially am fascinated my Hugh de Singleton’s occupation as a surgeon and doctor. His mysteries continuously keep me guessing who the guilty party is and I When Mel Starr writes a new book I cannot wait to read it! His books are unique to historical novels with settings in the 1400’s. An era you rarely see written about in fiction especially Christian fiction. I never cease to learn something new. His research has yielded such detail about every aspect of that time that people come to life. I especially am fascinated my Hugh de Singleton’s occupation as a surgeon and doctor. His mysteries continuously keep me guessing who the guilty party is and I never cease to be surprised! Also, his wonderful sense of humor adds even more entertainment. I've read several other books by Mel Starr and I have enjoyed them all. I find Surgeon Hugh to be a considerate and understanding man. He also has a humorous side. A hero he is not, or at least I felt so at first. No he's not the knight in shining armor but he does do what he says he will. The author goes into detail of the surgeon's way of surgery. Usually Hugh's family is part of the story but in this book, they aren't a part of it. If you've read Starr's other books, you may miss the family i I've read several other books by Mel Starr and I have enjoyed them all. I find Surgeon Hugh to be a considerate and understanding man. He also has a humorous side. A hero he is not, or at least I felt so at first. No he's not the knight in shining armor but he does do what he says he will. The author goes into detail of the surgeon's way of surgery. Usually Hugh's family is part of the story but in this book, they aren't a part of it. If you've read Starr's other books, you may miss the family in this one. They just seem to be an important part of everything the surgeon does. The author describes the smells, the characters, the surroundings with such vivid detail that you can picture yourself in this Medieval setting. You get a picture of what life was like for the soldiers and the civilians. With this book the story is set in France not England so many of the characters that you know from the other books, aren't in this one. The author gives you a mystery with history added in. He takes you slowly into the time period and not only gives you either the good or bad, but both. The book is a little shorter than the others which leaves less room for the twists and turns that a reader of Mr. Starr's is used to. I'm hoping if there is another book that we'll get to know the characters a bit more. A little more depth, a little more insight into their characteristics and their lives. I would definitely recommend starting with the first book and going from there. You may get a little insight into what is going on. Read the above section on about the book to get an idea of the contents of the book. I received this complimentary copy of this book from the author, Mel Starr and Kregel Book Tours and voluntarily decided to review it. I have read several in the Chronicles of Hugh de Singleton, Surgeon by Mel Starr and found each to be entertaining, enlightening as to the historical aspects, and refreshing. I was looking forward with delight to another Hugh de Singleton read and romp through the paths and over the streams of medieval England. That was not the case in this shortened episode in the ongoing tale. This story centers around the battle between English (Prince Edward) army and the France ending with the routing of th I have read several in the Chronicles of Hugh de Singleton, Surgeon by Mel Starr and found each to be entertaining, enlightening as to the historical aspects, and refreshing. I was looking forward with delight to another Hugh de Singleton read and romp through the paths and over the streams of medieval England. That was not the case in this shortened episode in the ongoing tale. This story centers around the battle between English (Prince Edward) army and the France ending with the routing of the French from Limones. It is essentially the march of the English toward French after crossing the English Channel, the encampment, and the activities of the men in the entourage of the Prince. Hugh de Singleton becomes embroiled in solving the murder of a soldier and is given latitude to try find the true murderer because of a certainty Hugh de Singleton did no murder. Singleton proceeds with his usual methodical analysis of location, people, and deeds and does come to the solution; and in finding out who did it, the cause becomes apparent. The deed was accomplished by and as a result of a perversion. I was surprised that perversion was a part of one of these stories. It was handled well and as Singleton said, "You cannot escape death..... No man can do so. But you may escape sin. To those who confess their wickedness the Lord Christ is merciful, though men are not. The Lord Christ judges a man, I think, not by where he has been, but by where he is going - the way he faces." I've read this entire series, and sometimes wonder why. It just plods along at its own pace and I just can't help rooting for Hugh de Singleton. This time he is off to France with his master, Gilbert, who must fight in France with Prince Edward for the recovery of Limoges. The contract he makes with Gilbert before they leave for the protection of his wife and children was very interesting. This ninth chronicle of Hugh de Singleton, Surgeon, was very short compared to the previous mysteries in this amazing medieval mystery series. Hugh has been married to his beautiful Kate for several years now, and with daughters Bessie and Sybil, they live in Galen House near Bampton Castle (a day's ride from Oxford) where Hugh is bailiff to the widowed Lord Gilbert Talbot as well as surgeon to the village of Bampton. A message arrives one day in 1370: Lord Gilbert must provide soldiers to join P This ninth chronicle of Hugh de Singleton, Surgeon, was very short compared to the previous mysteries in this amazing medieval mystery series. A message arrives one day in 1370: Lord Gilbert must provide soldiers to join Prince Edward in France. Hugh assumes that he will remain behind to administrate the affairs of Bampton Castle as he frequently does when Lord Gilbert lives in his other castle, but Lord Gilbert decides that Hugh's surgical skills may be needed on the battlefield, and he is compelled to go. Kate and the girls will move to the castle to run it in Lord Gilbert's absence, with the reeve taking on the bailiff's duties. The long trek to Burgundy, then Limoges, is difficult, especially when Sir Simon Trillowe, who resents Hugh for winning Kate from him and also burned Galen House (and had to pay for its rebuilding), joins the soldiers from the area surrounding Oxford. Hugh must watch his back for sure. I'll leave the rest for you to discover, but Hugh also meets Prince Edward (later called The Black Prince) on a few occasions. As always, this mystery is so well-researched and shows the unromantic realism of medieval life, especially for the peasants (this time, the peasants in the French countryside). Even the cadence and structure of the characters' speech possesses a subtle medievalism that is simply superb--not overdone nor underdone. The glossary at the beginning of each book allows the reader to learn much about medieval life, from the ingredients to medieval dishes to the name for underwear worn in this time period. Hugh himself is a compelling character: a humble man with some faults of temper and selfishness (like all of us), he is not a confident solver of mysteries so much as he is a careful one, a quality he has learned through experience. Hugh has earned the respect of Lord Gilbert, again through a proven track record of solving mysteries in and around Bampton, but now, in the French countryside ravaged by wars, Hugh is set to solve a mystery in order to save both his reputation and his life. I enjoy Mel Starr's Hugh de Singleton books; they're an easy, relaxing read, a sort of candy-floss for the mind but not so cheap and nasty. Starr tries very hard to create a realistic representation of Mediaeval life but there are times it comes across, to me, as some sort of historical reconstruction; Twentieth Century people in fancy dress. I know all this sounds like harsh criticism and have to stress, straight away, that it's not meant to be. Starr is the man I turn to to enjoy at a leisurel I enjoy Mel Starr's Hugh de Singleton books; they're an easy, relaxing read, a sort of candy-floss for the mind but not so cheap and nasty. Starr tries very hard to create a realistic representation of Mediaeval life but there are times it comes across, to me, as some sort of historical reconstruction; Twentieth Century people in fancy dress. I know all this sounds like harsh criticism and have to stress, straight away, that it's not meant to be. Starr is the man I turn to to enjoy at a leisurely pace. The "mysteries" within have almost foreseeable outcomes (we know Hugh will be alright and will get the nasty villain) and we know the story will have touches of historical reality - just like that Viking walking down the road outside the Jorvik Experience. It's fun walking or riding alongside Hugh as he encounters unpleasant individuals, wondering about the true meanings behind the Church's teachings, curing the odd sickness and carrying out the odd bit of surgery. Hugh de Singleton goes to war. As a companion of Lord Gilbert he is to serve as a surgeon - and also as a sleuth in the murder mystery, when he himself is a suspect. Not bad, not good. As for the length, this is more novella like than a novel. As for the historical settings - the author has obviously done his homework and the historical background is well-researched. The descriptions are vivid and Master Hughs musings are wise as usual. But unfortunately the mystery feels abrupt and there is very Hugh de Singleton goes to war. As a companion of Lord Gilbert he is to serve as a surgeon - and also as a sleuth in the murder mystery, when he himself is a suspect. Not bad, not good. As for the length, this is more novella like than a novel. As for the historical settings - the author has obviously done his homework and the historical background is well-researched. The descriptions are vivid and Master Hugh´s musings are wise as usual. But unfortunately the mystery feels abrupt and there is very little of intellectual sleuthing work present. Mel Starr can't write these books in this series quickly enough for me! What meticulously researched 14th century intrigue! Every detail, down to the clothing worn by each class in medieval England, is just fascinating, in and of itself, and yet the murder mystery put before Hugh de Singleton, Surgeon & Bailiff, is just as wonderfully engrossing. Just loooooooove this series of books. The mystery seemed a little weak in this book. Although I didn't know who did it, there wasn't a lot of suspense either. Not my favorite in the series, but still good. Not my favourite in the series but alright. As usual the author provides plenty of details to create a strong time and place (Middle Ages, England and France).Short quick read. 2 1/2 stars. Mildly entertaining mystery. Quick read. This book series is like a fresh drink of water for thirty historians like me!!!!! I'm excited about another book in the series after this one and look forward with rapture to reading it! I really enjoy these books, set in 14th century England and featuring Hugh de Singleton, surgeon. They are murder mysteries, but also very carefully researched descriptions of medieval life. Hugh is an exceptionally resourceful fellow, valued by Lord Gilbert who has appointed him bailiff as well as surgeon. I learn fascinating facts from each book. I gave this one only three stars because it barely qualifies as a novella - it was a good story, but at about 150 pages, hardly seems enough to be the I really enjoy these books, set in 14th century England and featuring Hugh de Singleton, surgeon. They are murder mysteries, but also very carefully researched descriptions of medieval life. Hugh is an exceptionally resourceful fellow, valued by Lord Gilbert who has appointed him bailiff as well as surgeon. I learn fascinating facts from each book. It is 1370 and Hugh de Singleton, surgeon and bailiff in the employ of Lord Gilbert Talbot, is ordered to accompany his master to France. The French king has seized Limoges from British control and Prince Edward has decided to send thousands of men to recapture his territories. It will be a perilous journey and Hugh feels reluctant to leave his wife and two young daughters but he knows that Lord Gilbert will need his medical skills, both on the long journey and later, on the battlefield. His gre It is 1370 and Hugh de Singleton, surgeon and bailiff in the employ of Lord Gilbert Talbot, is ordered to accompany his master to France. The French king has seized Limoges from British control and Prince Edward has decided to send thousands of men to recapture his territories. It will be a perilous journey and Hugh feels reluctant to leave his wife and two young daughters but he knows that Lord Gilbert will need his medical skills, both on the long journey and later, on the battlefield. His greatest concern is that he will be killed and so he is very worried about what the future would then hold for his family. So, before leaving for France he does all he can to ensure their future security should he not return. However, the journey and the battle are not all that he has to fear; his arch-enemy, Sir Simon Trillowe, will also be a member of the invasion force. Hugh knows that his life will be in danger as Sir Simon holds a long-term grudge against him, and is intent on seeking revenge whenever any opportunity presents itself. When Sir Simon dies in mysterious circumstances suspicion immediately falls on Hugh, especially as the two men have already been at loggerheads during the journey through France. Nobody in Sir Simon’s camp believes in Hugh’s innocence but, fortunately, Lord Gilbert and Prince Edward do and they encourage him to carry out his own investigations to discover who is responsible for Sir Simon’s death. The author’s comprehensive knowledge of the history of medieval England was used to good effect to create a convincing sense of time and place in this easy to read story. I enjoyed the way in which his meticulous attention to detail created a very credible image of what life was like for people living during that time. I was fascinated by the descriptions of battleground conditions and military strategy, as well as by the information about the range of herbal remedies available for treating a whole range of medical conditions and injuries, as well as details of the rather crude surgical techniques available at the time. I also appreciated the “Afterword” as this helped to put the story into an historical context – it is always good to learn something new! Hugh is a likeable character and I enjoyed his thoughtful and quite philosophical musings about his life, religion and the situations he encountered on a daily basis. The sleuthing/mystery elements of the story were well-plotted and entertaining. This is the ninth story in The Chronicles of Hugh de Singleton, Surgeon and as I had read none of the preceding books there were, understandably, references to previous characters and incidences which would have made more sense to someone who had read the earlier books. In spite if this, the story is straightforward enough to be read as a stand alone piece. I found it a quick and entertaining read but did find myself wondering at which age group it is aimed. The quite simple, straightforward writing style made me think it is a book suitable for teenagers/young adults and, if that is the case, I would award it four stars but as a personal read I would have to give it one less because, at only 148 pages long, it was a rather short novel; in addition, I would have preferred more complexity in the story-telling. I received this book from Lion Hudson plc (via Library ThingEarly Reviewers) in exchange for an honest review. For some who have been following this series, the length of this book proved a disappointment. It was only 150 pages, instead of the usual 225-50. I confess, I had my own reservations in that regard, but I certainly enjoyed it. As the synopsis makes clear, this instalment of the Hugh de Singleton Medieval mystery series involves the Surgeon Hugh being accused of the murder of his long-time enemy, Sir Simon Trillowe (a knight who had courted the woman he married, and once tried to burn down his h For some who have been following this series, the length of this book proved a disappointment. It was only 150 pages, instead of the usual 225-50. I confess, I had my own reservations in that regard, but I certainly enjoyed it. As the synopsis makes clear, this instalment of the Hugh de Singleton Medieval mystery series involves the Surgeon Hugh being accused of the murder of his long-time enemy, Sir Simon Trillowe (a knight who had courted the woman he married, and once tried to burn down his house). Against the backdrop of the Siege of Limoges in 1370, the intrepid sleuthing surgeon and his erstwhile friends Arthur and Uctred must rise above their own resentments to solve the mystery before it’s too late. Personally, I appreciated the way that Mr Starr took this novel out of Bampton, the Oxfordshire village where Hugh and his family make their home. It’s set in Aquitaine, one of the former English possessions in France during the Hundred Years War. The setting allows for the story to explore Medieval warfare, and its impact to society, as well as introducing some of the movers and shakers of the period. Major political figures and politics generally do not usually feature in this series, but in this instalment the Black Prince, also known as Edward of Woodstock, the eldest son of King Edward III makes an appearance. Well, several appearances to be exact, which adds an interesting flavour to the story. Of course, there are the usual historical details about everyday life and Medieval medicine as well, which are one of the things I like most about this series. As is often the case, there is some exploration of moral and religious issues. In this case, Hugh finds his convictions tested when he must discover that happened to his enemy, and deal with his father who seems determined to see him hanged for a crime he did not commit. He would rather leave the matter well alone, but the accusation assures he cannot, and must face his enemies as well as his own resentments head on. Regular readers should be warned that this story does have a somewhat darker and more melancholy tone than many of the previous titles, due not only to the mystery but other events which befall major characters. That should not necessarily put anyone off, but just be aware that it marks a slight diversion from the usually light tone. Overall this was a good story, and well worth a read for fans of the series and Medieval mystery lovers more generally, though I admit it was not my favourite title in the series (I preferred book seven The Abbott’s Agreement and book five The Tainted Coin). I requested and received a copy of this book from the publisher Lion Fiction. I was not required to write a positive review, and all opinions expressed are my own. Hugh de Singleton is summoned with his employer, Baron Gilbert, by Prince Edward to go to battle against France. Hugh is taken along not in his role as bailiff, but as a surgeon to treat battle wounds. He leaves behind his wife Kate and two young daughters not knowing if he will return or be the victim in battle, even though he isn’t in the fighting ranks. Upon reporting to their first stop on the journey to Dover, England where they will then cross the English Channel into France, Hugh makes an unsettling discovery. His old enemy Sir Simon Trillowe is among the other fighting men called by Prince Edward. Sir Simon holds no love for Hugh and goes out of his way to let Hugh know that he still holds a major grudge. However, while waiting for the battle to begin, Sir Simon’s body is found face down in a poisoned well. Hugh is the first suspect as he and Simon have had a couple of run-ins at the encampment. Hugh enlists Baron Gilbert’s help and they both persuade Prince Edward to give Hugh time to find the real murderer. Hugh ferrets out the guilty party and a confrontation ensues. While the story is good, I kind of felt cheated at this abbreviated novel. In the past, his novels are usually about fifty pages longer with more time spent with Hugh, his internal musings that I find very interesting and sometimes funny, as well as his interactions with other characters. This one definitely surprised me in a negative way and that is that homosexuality or “perversion”, as it was referred to in the book, was included. I did like the setting of France and the details about the life of a medieval soldier. I love Hugh’s wit and tenacity in his search for the culprit. I look forward to reading more medieval tales of the adventures of Hugh de Singleton in the future, but now I will be a bit wary as to the contents. Book ten is titled Deeds of Darkness, but as of now there is no release date. English holdings in France have been taken by King Charles of France and Prince Edward has determined to reclaim them. Unfortunately for Hugh de Singleton, Lord Gilbert Talbot has been requested to supply some of his men for the effort. As the surgeon to Lord Gilbert, Hugh's value in the forthcoming battle makes his duty unavoidable. Leaving Kate, Bessie, Sybil behind is a great concern to Hugh as his return from France is anything but certain. And when Hugh learns that Sir Simon Trillowe is among those who will be going to France he has an even greater concern regarding his return home. With war and the trials of travel death is expected but when a murder is the suspected cause of Sir Simon's untimely demise the man's past with Hugh makes the most likely suspect. With his own life on the line Hugh must determine who had case to murder the man. The list of those with cause to dislike the man is long but did any have cause to take his life? With his normal attention to detail Hugh, with the support of Lord Gilbert, and aided by Arthur uncovers evidence that contradicts what has been reported. Who is lying? The answer to this question may be the key to determining why. And when the why is answered the who is revealed. Life is fragile and Hugh is about to discover yet again just how fragile it is. Lucifer's Harvest takes the reader into the heart of 14th Century life and it's day-to-day workings. Life wasn't easy and one's future rested on the whims of kings and lords who ruled with little regard to the costs that their actions had upon their subjects. The need to rule ever expanding territories taxed the strength's of the hardiest men and often left those who survived in a weakened state. If you are in the mood for a mystery get ready to enjoy a medieval who-dun-it with this latest chronicle from the life of Hugh de Singleton. I won this book through Goodreads. Very good. So much happened in a short time. Totally engrossing. A must read in the series. The tenth installment of The Chronicles of Hugh de Singleton, Surgeon, Lucifer’s Harvest, continues the adventures of Master Hugh as he accompanies the military campaign of Prince Edward of England as he seeks to recover his lands in Acquitaine. Hugh’s role of surgeon may keep him out of direct military involvement, but it does not keep him from danger. The death of his nemesis mobilizes Hugh to uncover the murderer before he finds himself on the end of a rope. 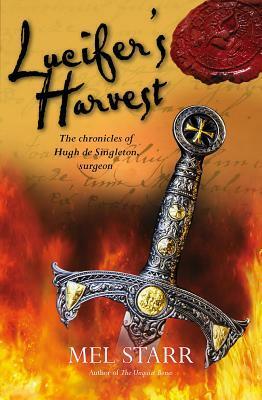 Mel Starr does a great job of bring The tenth installment of The Chronicles of Hugh de Singleton, Surgeon, Lucifer’s Harvest, continues the adventures of Master Hugh as he accompanies the military campaign of Prince Edward of England as he seeks to recover his lands in Acquitaine. Hugh’s role of surgeon may keep him out of direct military involvement, but it does not keep him from danger. The death of his nemesis mobilizes Hugh to uncover the murderer before he finds himself on the end of a rope. Mel Starr does a great job of bringing medieval society to life. In Lucifer’s Harvest, the emphasis is on war. Starr’s impeccable research is evident in the detail portrayed in the story. Warfare was very different in the 14th century than it is today, and I found the strategy and weapons used very interesting. Hugh, as always, is resourceful in his investigations. With only limited understanding of science and forensics, his intelligence and intuition keep him on track. Hugh is dedicated to truth in all things. His religious views border on the heretical for the time, but add to the thoughtfulness of his examination of human motives and God’s justice. Lucifer’s Harvest is a bit darker than Starr’s previous books. Life is precarious and death comes for all, young and old. The pragmatism in a time of low life expectancies and high child mortality does not subtract from the grief and sorrow of a loss. It is not necessary to read the previous 9 books of the series to enjoy Lucifer’s Harvest, but I definitely recommend beginning from the beginning of this series. All the books get a recommended rating from me. Readers will enjoy the acquaintance of Hugh de Singleton whether introduced from the first novel, or starting from the middle of the series. Lucifer's Harvest, is one of the shorter mysteries and would be a quick and efficient way to "sample" the series. I suspect it will whet one's appetite for the whole series. Set in medieval times, it's fascinating to learn of historical details and locations (and even medical practices of the time), while enjoying the wit and wisdom of the surgeon (and baili Readers will enjoy the acquaintance of Hugh de Singleton whether introduced from the first novel, or starting from the middle of the series. Lucifer's Harvest, is one of the shorter mysteries and would be a quick and efficient way to "sample" the series. I suspect it will whet one's appetite for the whole series. Set in medieval times, it's fascinating to learn of historical details and locations (and even medical practices of the time), while enjoying the wit and wisdom of the surgeon (and bailiff), Hugh. In this installment, Hugh crosses paths with Sir Simon, a man who has held a grudge since he lost the hand of Kate to Hugh. When Sir Simon comes to an untimely end, Hugh is the obvious prime suspect. So while he is providing surgical support to wounded soldiers, Hugh must try to clear his name and find the guilty party. I enjoy how Starr gives the readers a front row seat in the theatre of Hugh's mind. Knowing his plans and being party to his inner mental calculations, makes the reader feel as if he is not only in the story, but assisting with the investigations. Each book in the series adds a little more dimension to the cast of characters. Lucifer's Harvest is a great read during the winter holidays and would make an especially great gift for any mystery enthusiast! I hope that Starr will continue chronicling the investigative life of Hugh de Singleton. I received this book free in return for an honest review, this in no way influences my opinion and the following is all my own words and thoughts. This is the sort of series where you can start almost anywhere and not feel that you have missed anything majorly significant, and I did just that. This is the first book I have ever read by Mel Starr and while I wasn't disappointed I also can't say I loved it. Lucifer's Harvest follows the adventure of a surgeon in medival times. His chara I received this book free in return for an honest review, this in no way influences my opinion and the following is all my own words and thoughts. Lucifer's Harvest follows the adventure of a surgeon in medival times. His character was very well developed (as it should be in the ninth book), and most of the other cast members that make up the book were well written although their voices were all written in a very similar tone. The plot followed the same routine, it was developed but simplistic. Many details of actual medival times were well placed and thought out to show off a well done setting which ended up being my favourite part of the book. The setting was very well explained and incredibly easy to picture while reading, but the plot being so plain made it harder to appreciate the setting. Lucifer's Harvest is different from the others in the series in that Hugh travels further from his home than in the other books, and not for the purpose of solving a crime, but for being present during a war. Since this is a suspe This series is perhaps the most unusual suspense/mystery series that I read, being set in medieval times. Every time I think the series is done, the author comes out with another novel in the series and surprises me..... and I see there is a #10 slated, so I am happy. I always look forward to the next installment in Mel Starr's Chronicles of Hugh de Singleton, Surgeon. These books are unlike any others I've read, and I love them! Lucifer's Harvest, as with all of the books in this series, is written as Master Hugh's journal. I love this style, as it allows for humor (often self-deprecating) and foreshadowing. Most of the novel focuses on Hugh's quest to find a murderer—which is often Hugh's quest in these novels. However, in Lucifer's Harvest, Hugh is the one w I always look forward to the next installment in Mel Starr's Chronicles of Hugh de Singleton, Surgeon. These books are unlike any others I've read, and I love them! I really enjoyed trying to discern the murderer's identity along with Hugh, and, while I did guess his identity fairly early on, the motive completely surprised me. While I always love Mel Starr's novels, I think Lucifer's Harvest is one of my favorites. It's humorous, engaging, and oh so enjoyable.